Deconstructing the Authorship of Siempre ayuda la verdad: A Play by Lope de Vega? 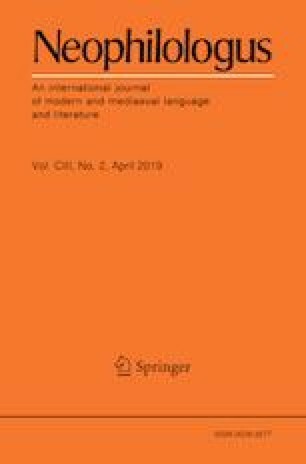 In this article I focus on the authorship of Siempre ayuda la verdad, an early modern Spanish play first published in 1635 as part of the volume Segunda parte de las comedias del maestro Tirso de Molina. This drama, which is one of several early modern Iberian plays related to the figure of Inês de Castro, is currently considered by most scholars as penned by Juan Ruiz de Alarcón, probably in collaboration with Luis de Belmonte and maybe even with Tirso de Molina. In the first part of this paper I will examine how this traditional attribution relies on a bibliographic ghost, subjective impressions of style, and the creation of a scholarly discourse based on the repetition of statements—including some explicitly made up—without any critical examination of facts. The possible attribution of this play to none other than Lope de Vega—a name that has been associated with Siempre ayuda la verdad since 1906—has not received specific examination until now. I will proceed to do so in the second part of this paper by using a variety of resources that offer objective criteria: early modern documentation, strophic versification, stylometry, and orthoepy. This article has benefited from financial support from the Spanish Agencia Estatal de Investigación and the European Social Fund (Ramón y Cajal 2016 Program, RYC-2016-21174), as well as from the Spanish MICINN (FFI2015-65197-C3-1-P, FFI2015-71441-REDC, and FFI2015-66216-P). Ferrer Valls, T., et al. (2018). Base de datos de comedias mencionadas en la documentación teatral (1540-1700). CATCOM. http://catcom.uv. Accessed June 1, 2018. Pallares, B., & Vázquez Fernández, L. (2015). Acercamiento bio-bibliográfico a Tirso de Molina. Resource document. Instituto Histórico de la Orden de La Merced. https://www.odemih.com/FILE/LA%20MERCED%20EN%20LA%20HISTORIA/Acercamiento%20bio-bibliografico%20a%20TIRSO%20DE%20MOLINA.pdf. Accessed June 1, 2018. Peña, M. (2005). Juan Ruiz de Alarcón: reconstrucción biográfico-crítica. Resource document. Biblioteca Virtual Miguel de Cervantes. http://www.cervantesvirtual.com/nd/ark:/59851/bmcb2865. Accessed June 1, 2018.